Slip dresses are a stunning essential and so easy to dress up or down. Making them for yourself allows for many different ways to finish it and work in with your own style and body - fabrics, lengths, split features, necklines, wrap sections, straps - the list goes on. Once you nail one you can use this as a base pattern to play around and keep making different types. Unfortunately this rusty crushed fabric was a one off otherwise I would've stacked up a whole wardrobe's worth. Measure you're full circumference length at your widest point so the dress can easily slip over (generally your bust or hips). BACK: For the back panel begin by cutting a rectangle that has a width 1/2 of the full hip circumference initially measured and then add 2.5 inches. The a length will measure from your middle chest to mid calf (this will allow it to reach below the knee after hems). To cut the angle of where the arms will sit, go to the top and mark a spot 10cms in from the corner and then another mark 20cm down the side from the corners. Draw a line from each mark (on the bad side) and cut along the line. FRONT: The front side is made up of three panels to allow for the split. Use the back as a template to measure off. All will be the same length. The width of the middle panel is the measurement of the top short side on the back, plus 3cm for seams. The two side panels are 13cm wide which includes seam allowance. Follow the above steps again to cut the arm angles. NOTE: Make sure that when the good sides of the fabric on both side panels are facing up the angles are in opposite directions. STRAPS: For the straps cut two pieces 40cm long by however wide you want them to end up. I wanted these to be quite thin so I cut my to 3.5 centimetres wide and they ended up being around 1cm when finished. You should now have 6 pieces of separate fabric in front of you. We'll prepare the front side first. So lay down the middle panel, good side up and place the good sides of the side panels down and on top with full length sides aligned. Ideally you want the split to finish mid thigh so measure how far it is from your mid thigh to where the hem will finish. Take this measurement and add a mark this length from the bottom to indicate where to stop sewing on the side/middle panels. Pin down the full lengths and sew from the top until this mark. Time to clean up some of the edges. 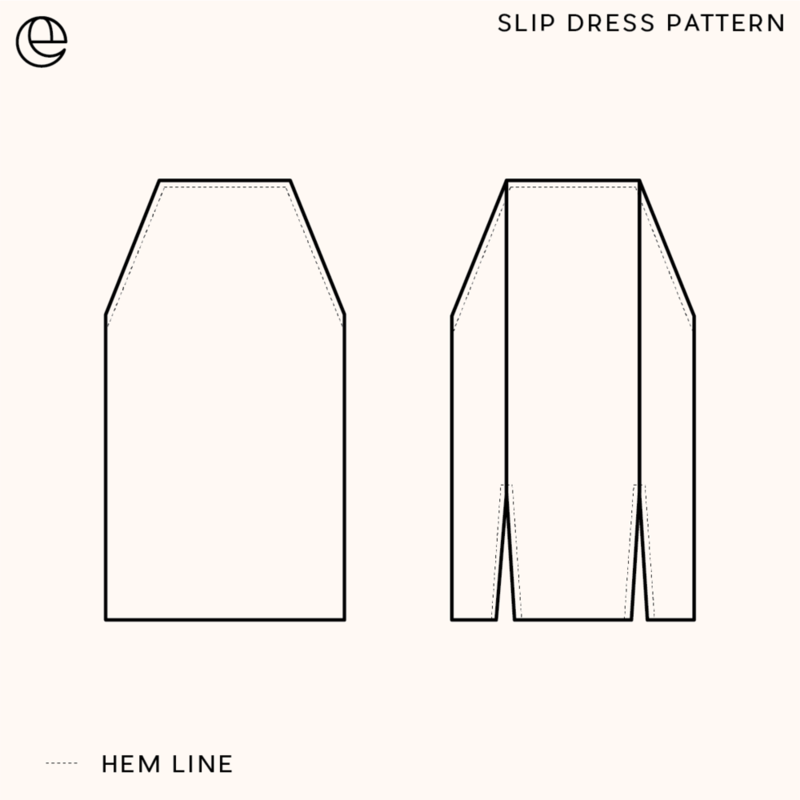 To hem the splits, fold in each side as you normally would and pin in place. Start at the bottom and sew straight until you get about 1cm past the split point, then stop but don't remove the fabric yet. Turn the needle handle until it's sitting in the fabric then lift and pivot the fabric so you're angled to sew across the joint fabric. Sew until you're 1cm over the line and repeat the pin pivot and continue sewing back down the other side towards the bottom. Repeat for other split. Hem top sides of both back and front panels. Lay the front and back pieces on top of one another with good sides of the fabric facing. Pin down the sides from armpit to bottom. Sew together along here. Preparing the straps. Fold the the good sides together and sew along one short side and the frayed long side, leaving the other short end open to fold through. Get a small pen or clean paintbrush tip and fold the fabric onto it and push through. Once the clean sides are out pin in place onto dress and try on to see which length you prefer. Adjust placement accordingly and sew straps on. Hem the bottom of the dress. Try on the dress on to see how it all fits and adjust anything that needs it. I found I had to take in the arm pit section which involved starting a few centimetres in at the top of the seam and angling back towards the original line to fit my body shape more. Aaaand there you have it. A beautiful, simple slip dress to add to the wardrobe. Layer it with a tee underneath, cover with a jacket, accentuate the legs with heal boots, tie a knot in the bottom, add a big graphic tee on top and tie around the waist, or just simply wear on it's own. So many ways to wear it and make it look different each time. Now you’ve made your own slip dress, here’s some tips on how to style it!